When W.B Yeats claimed “there are no strangers here, only friends you haven’t yet met,” I’m almost certain he was talking about Finnish death metal. Whenever I’m in need of a riff more monstrous than Shelley and vocals to cripple the craw, I can always rely on those Nordic ne’er-do-wells to deliver the goods. 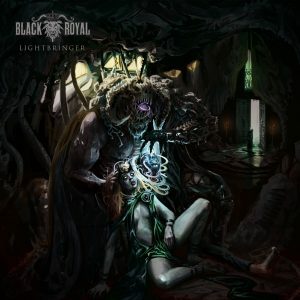 One such band, Black Royal, have been toiling amidst a clutch of EPs, preparing to release their debut, Lightbringer, which comes to me via sheer chance and my own unassailable taste. 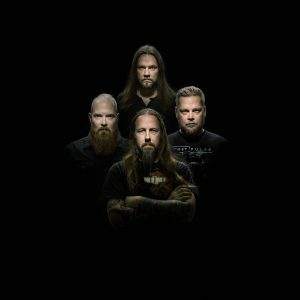 Soliciting a sludge-riddled death metal to wade knee-deep in, Black Royal are bedecked with some serious weight and have absolutely no compunction in throwing it around, utilizing many of extreme metal’s more primal genres to deliver their megaton blow. Upon first glance, I assumed the Finns were another death metal band chasing that retro high, but when I peered deeper into the molasses-thick material they so zealously brandish, I was surprised to find an act willing to push their work just as deep as the knife will go. Lightbringer‘s title is the utter antithesis of its creator’s nature, wallowing in as much three-dimensional dark as possible. This is squarely where a band like Black Royal hones its craft; giant riffs, primal groove and a ubiquitous umbra that lasciviously creeps into each song. While all this holds absolutely true, the album is also disarmingly versatile. “Cryo-Volcanic” and “Pentagram Doctrine” revel in a primitive death metal that emphasizes an inescapable capacity for riffage, while “Self Worship” introduces a feral combination of crust and doom to extol the album’s Thelemic concept of existential rebellion and rebirth via that most left-hand of paths. Vocalist, Riku, vomits a curse upon the lyrics with a vituperative screed of snarled growls, grounding the album’s occasional reprieves in a base extremity. In the band’s own words, their musical influence can be summarized as “Sabbath in one ear and Entombed in the other” – never is this more clear than on “Salvation,” transmuting traditional 70’s doom riffs into a boozy swagger, complete with a sunken vocal effect and distinctly retro nuances. Black Royal expertly use their density as an instrument; while many of the songs allow for certain dalliances with other abrupt genres, the album is tied together with a common depth of rhythm that unites the material – this defines the record’s character, pulling just as much weight as any of the instruments. That looming sludge presence never abates, informing the slowest to the fastest of cuts – while this is almost explicitly up my street, those listeners happy to settle for somewhat thinner fare may not wring quite as much pleasure from these turgid measures, but that’s okay – that’s what Nightwish is for. Although the master is industry standard, the even mix generously accentuates the raucous bass tone that sprawls across the record. Guitarist, Toni, deserves mention for not only supplying thunder-riffs a-plenty, but for also doing his very best to exploit subtle compositional combinations. Favoring the wah-wah peddle, certain classic rock motifs are ever-present in his lead work and the album is absolutely richer for his input. His presence on “Dying Star” shines brightly, issuing a cluster of supergiant chords before descending into neutron star doom density. “The Chosen,” however, stands out the most, boasting a layer of synth and immediately memorable guitar lines. Almost shamanic in nature, the song tips a nod to certain gothic influences as an ever-advancing rhythm trudges over a triumphant chorus; it’s Lightbringer‘s most cinematic moment and a welcome distinction. To step out of the relative unknown already baring an apex predator’s grin is rare, but Lightbringer knows that to define is to limit, and arrives secure in its advanced substance and magnetic presence. Those taken with The King is Blind or Lazarus Blackstar1 will find plenty to tackle here, as Black Royal provide more than enough brazen brawn and indomitable force of will to sate any savage yearning. I suspect Lightbringer will continue to illuminate my 2018 even as we delve greedily and deep into another year of great metal – I suggest you, too, walk into the light.